At first glance, looking at a bunch of space rocks doesn't sound that exciting. Like, aren't they just a bunch of rubble? What use can they be in understanding the Solar System compared to looking at planets or moons? Turns out that asteroids are key to figuring out how the Solar System came to be, and that they're more interesting than they appear at first glance. Below, we have 10 facts about asteroids that will make you reconsider that biased first impression. Most asteroids are in a "belt." While there are asteroids all over the Solar System, there's a huge collection of them between the orbits of Mars and Jupiter. Some astronomers think that could have formed into a planet if Jupiter was not nearby. By the way, this "belt" may erroneously create the impression that it is chock full of asteroids and require some fancy Millennium Falcon-style maneuvering, but in reality there are usually hundreds or thousands of miles in between individual asteroids. This shows the Solar System is a big place. Asteroids are made of different things. Dark C (carbonaceous) asteroids, which make up most asteroids and are in the outer belt. They're believed to be close to the Sun's composition, with little hydrogen or helium or other "volatile" elements. Bright S (silicaceous) asteroids and are in the inner belt. They tend to be metallic iron with some silicates of iron and magnesium. Bright M (metallic) asteroids. They sit in the middle of the asteroid belt and are mostly made up of metallic iron. 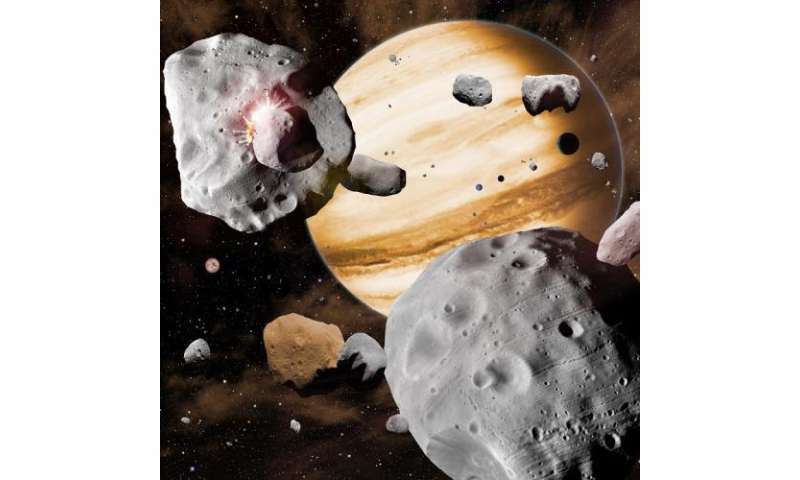 Asteroids also lurk near planets. NASA also has classifications for this asteroid type. Trojans stay in the same orbit as a planet, but they "hover" in a special spot known as a Lagrangian point that balances the pull of the planet's gravity and the pull of the Sun. Trojans near Mars, Jupiter and Neptune have been discovered—as well as at least one near Earth in 2011. 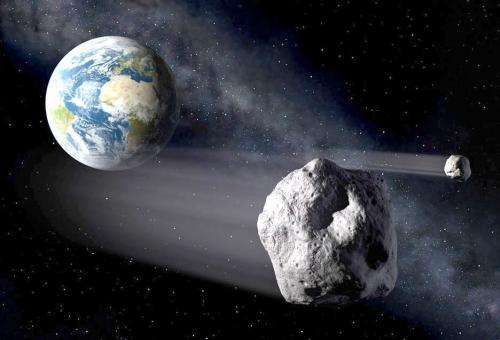 We also have near-Earth asteroids, which cross our orbit and could (statistically speaking) one day pose a threat to our planet. That said, no one has yet identified any one asteroid that will one day collide with our planet for sure. While we think of moons as something that orbits a planet, asteroids also have smaller bodies that orbit them! The first known one was Dactyl, which was discovered in 1993 to be orbiting a larger asteroid called Ida. More than 150 asteroids are known to have moons, with more being discovered periodically. A more recent example is one discovered orbiting Asteroid 2004 BL86, which passed 750,000 miles (1.2 million kilometers) from Earth in early 2015. We have flown by, orbited and even landed on asteroids. NASA says there are more than 10 spacecraft that accomplished at least one of these, so we'll just cover a couple of examples here. NEAR Shoemaker touched down and survived for weeks on 433 Eros in 2001 despite not being designed to do it. NASA's Dawn spacecraft spent months orbiting Vesta—the second-largest member of the asteroid belt—in 2011 and 2012. And in 2010, Japan's Hayabusa spacecraft made an astonishing return to Earth bearing samples of asteroid Itokawa that it nabbed in 2005. Asteroids are too small to support life as we know it. That's because they're too tiny to even hold on to atmospheres. Their gravity is too weak to pull their shape into a circle, so they're irregularly shaped. To get a sense of just how small they are in aggregate, NASA says the mass of all the asteroids in the Solar System is less than our Moon—which only has a tenuous "exosphere" itself. An asteroid could have killed the dinosaurs. The fossil record for dinosaurs and other creatures of their era show them rapidly disappearing around 65 million or 66 million years ago. According to National Geographic, there are two hypotheses for this event: an asteroid or comet hitting the Earth, or a huge volcano eruption. The case for an asteroid comes from a layer of iridium (a rare element on Earth, but not in meteorites) that is found all over the world, and a crater called Chicxulub in Mexico's Yucatan Peninsula that is about 65 million years old. Iridium, however, is also found inside the Earth, which lends credence to some theories that it was volcanoes instead. In either case, the resulting debris blocked the Sun and eventually starved those survivors of the impact. At least one asteroid has rings. Called Chariklo, scientists made the surprise discovery in 2013 when they watched it pass in front of a star. The asteroid made the background star "blink" a few times, which led to the discovery that two rings are surrounding the asteroid. Below, we have 10 facts about asteroids that will make you reconsider that biased first impression. Speaking of biased opinions, most of their "facts" are anything but that. Let's review. 1.) Asteroids are leftovers of the early Solar System. This is far from factual, it is merely an assumption based upon a belief system. No test can be devised to "prove" this as being a fact. Fail! 2.) Most asteroids are in a "belt." This is likely true, it also suggests a common origin for this "belt". Note the belts proximity to the "God of War", Mars. The Jupiter comment is more nonsense though. 3.) Asteroids are made of different things. Obvious, but the likelihood of it's positioning is due to the objects interaction with the Sun's electric field and not the Sun's "pressure". 4.) 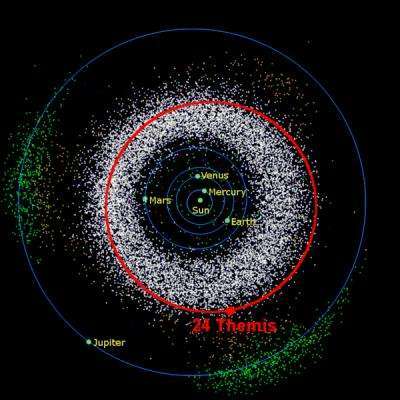 Asteroids also lurk near planets. Also true, this begs the question as to why. Probably because that is where the asteroids originated. In respect to Pluto, we should call them dwarf moons. 6.) We have flown by, orbited and even landed on asteroids. No obfuscation here, although I'm sure there are some conspiracy theories out there. 7.) Asteroids are too small to support life as we know it. This is a fact, doesn't stop silly theories such as panspermia from being proposed though. 8.) An asteroid could have killed the dinosaurs. This is more speculation. And since when did a fact involve "could have"? 9.) At least one asteroid has rings. This begs the question as to how this can happen. Kristian Birkeland was able to replicate a ringed system in his lab experiments, it involved charged bodies in a plasma. You'd think this might be a hint, astrophysicists refuse to acknowledge this real fact however. 10.) This silly author from 'Universe Today' cannot count to ten, but since when has 'Universe Today' been concerned with "facts".